Most people think of Custom Napkins as those little extra details to add to a birthday or a wedding party. Choosing a coordinating color to go with the paper plates or the birthday cake is often where most stop when considering purchasing napkins. Imagine what a special touch it can add to a party when those napkins have the name of the birthday person or the names of the newly married couple along with a special greeting? Religious and Spiritual Organizations can use napkins printed with their affiliated logo and a quote from scripture. These napkins can be use for all kinds of events held at a church, temple, synagogue or mosque. From fundraisers, such as bake sales, to study groups or use these special napkins for teas or for after service gatherings. They are also excellent to bring to interfaith gatherings to help advertise and reach potential new congregants. Restaurants, Cafes and Bars can benefit from having their logos and contact information printed on napkins. Think outside the box and consider having special events, hours of operation, drink or menu specials printed on napkins. When a customer writes a note or a phone number on the napkin, they will also be bringing home information about your business! Schools, Colleges, and Community Centers can have napkins printed for fundraisers, to promote clubs, list various sporting events, advertise upcoming theatrical shows or musical concerts. There are too many options to list for specially designed napkins! 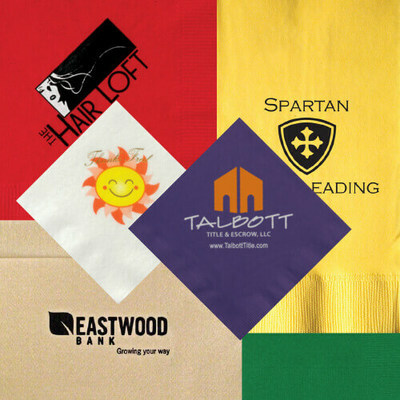 Businesses of all kinds can have napkins custom printed to hand out at trade shows and conventions or to keep in client waiting rooms with complimentary coffee and tea. Of course most have business cards to hand out, but think of the extra reach something unexpected like a napkin can have! How about having personal napkins made available for home? Get napkins printed with a favorite quote or something that just speaks of you or your family and use them when guests come over. It can turn a casual visit into a memorable experience for all. The above are just a few examples of the endless possibilities where personalized napkins can be used. They are an inexpensive option to make an impression, commemorate a special event or use for marketing and advertising. The sky's the limit! We would love to work with you! Feel free to contact us if you have any questions, and we will do our best to make sure your event, party or promotion is full of fun and a success! What are the Differences Between a Portfolio and a Padfolio?